Estiponies at the Silver Syringe Awards. (L-R) Terri Ogden, Mikalee Byerman, Paige Galeoto, Edward Estipona, Jackie Shelton, Nicole Dion. Estipona Group President Edward Estipona says the agency’s work with Immunize Nevada is a reflection of the team’s commitment to the community. “The science is there — vaccinations save lives and keep our entire state healthier,” Estipona said. “We live here, and many of us are raising our families here. 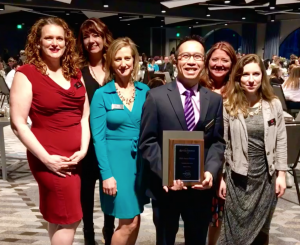 We take this commitment very personally.” The 15 Silver Syringe categories recognize healthcare providers and community partners, nominated by their peers, as exemplifying outstanding immunization practices. Silver Syringe began in 1998 as a way to celebrate Nevada’s immunization successes and champions. Today, the event has become a statewide tradition for Nevada’s immunization and healthcare stakeholders. This annual ceremony is an opportunity to honor those immunization champions who provide excellent service, but may not otherwise be recognized. This year’s ceremony was held in conjunction with National Immunization Awareness Week (NIIW). NIIW is an annual observance to highlight the importance of protecting infants from vaccine-preventable diseases. It celebrates the achievements of immunization programs and their partners in promoting healthy communities. For more than 23 years, the Estipona Group Advertising and Public Relations team has been providing marketing communications that capture attention, engage audiences and deliver results to local, regional and national clients based throughout the United States. For more information, visit www.estiponagroup.com.